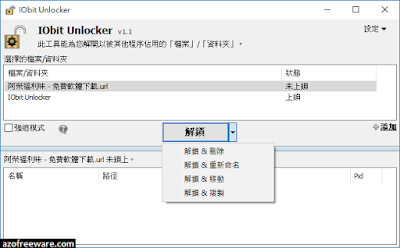 IObit Unlocker Portable is a light-weighted yet powerful tool designed to fix the "Cannot Delete" or "Access Denied" problems. It can "Forced" terminate all related processes that prevent you from deleting or accessing files / folders that you need to. It also provides several useful options to make your work easier, like "Unlock & Delete", "Unlock & Rename", "Unlock & Move", and "Unlock & Copy". You wouldn't be annoyed any more by messages like "Cannot delete file: Access is denied", "The file is in use by another program or user", or "There has been a sharing violation"!